Training is very hard. ¡Or not! Find out by visiting ours specialized training centers located in Ourense, Galicia (Spain). 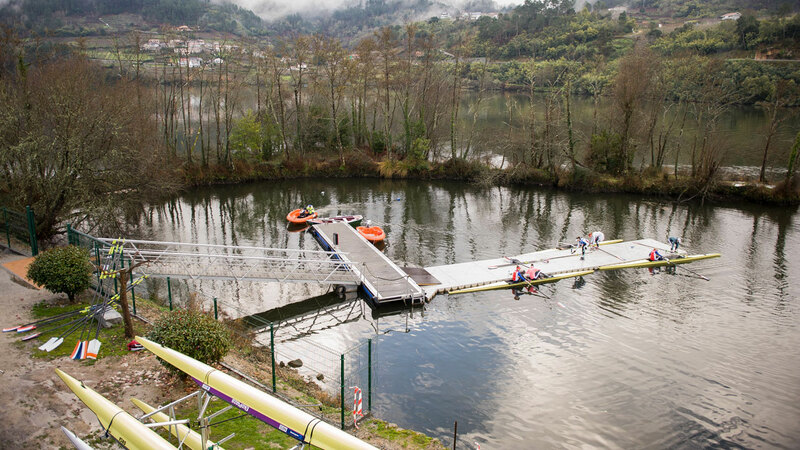 This is where the Castrelo de Miño and Frieira reservoirs are located, two places that meets the appropriate conditions for the training of competitive rowing and canoeing. the needs of a high level rowing team. The facilities are located at three different points along the banks of the river Miño: At Laias and Arnoia are the Meeting Centres, the first at the Spa Hotel Laias-Caldaria and the second at the Spa Hotel Arnoia Caldaria. The Spa Hotel Laias has 98 rooms and is located on the banks in the middle of the Castrelo de Miño reservoir. The Spa Hotel Arnoia Caldaria has 89 rooms and is located on the banks of the Frieira reservoir. Both meeting centres have rowing dock, weights room, equipment room with rowing machines Concept II, docking for vessels on shelves near the pontoon, boats for coaches and of course all the amenities of the hotel-spa. In the village of Castrelo de Miño, situated 6km down river from the Meeting Centre is the Nautical Club and a 2000 m regatta track with 6 lanes and “Albano System” marking. The reservoirs in Castrelo de Miño and Frieira have been over the last fewyears a meeting place for diverse teams from different countries such as Bielorrusia, Holland, Australia, Estonia, England, Sweden, Bulgaria, Rumania and Spain. Complete thermal facilities for leisure, rest and relaxation. Special treatment for athletes indicated for two moments: during training and in the recovery phase. A complete room with all the equipment needed for muscle treatments. The center offers a comprehensive catering service (buffet and menu) specialized for athletes. 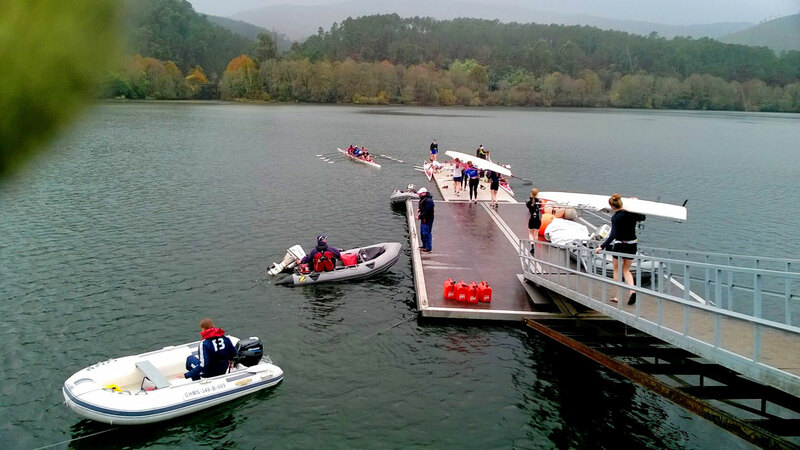 Castrelo de Miño and Frieira reservoirs have everything you need for high level training. The Castrelo de Miño and Frieira reservoirs have exceptional conditions for competition training in rowing and canoeing as it allows up to 25km of rowing in still water with only 1 turn, i.e. a round trip. It also has a 2,000 m track marked out with "Albano System" and NE–SW orientation. The average annual temperature is around 15º with summer being hot and dry, spring and autumn are mild and winter is somewhat cold with temperatures above 0º. Windy days are rare, intensity is usually low not going over 8 m/s, appearing more later in the day and with a predominant W-SW (255º) direction. In addition, the natural flow of the river along the reservoir makes for different geographical changes in direction which allows for training in different wind orientations as there is always a sheltered stretch. As for rainfall, the location of the region of O Ribeiro allows for the squalls, which come to Galicia in autumn and spring from the Atlantic, to be stopped by the mountains in "Serra do Faro" and "Serra do Suido" in Avion, with rainfall during these seasons being much lower than those recorded on the coast of Galicia. Summary data from 01/09/2015 to 31/08/2016 obtained from the automatic station Prado (Castrelo de Miño) in the province of Ourense (Spain). Use this form if you wish and we will be happy to accommodate your request.